Way: Live streaming uses Apple’s HTTP Live Streaming technology. Viewers require an iPhone, iPad, or iPod, or a PC with Microsoft Edge on Windows 10. Streaming via Apple TV requires an Apple TV (2nd or 3rd generation) or later or an Apple TV (4th generation). As being a bit curious Apple doesn’t allow its event to streamed via Firefox or chrome. Apple is the world’s largest IT company by revenue and total assets. It is considered as world’s second-largest mobile phone manufacturer. Everybody is familiar with Apple products nowadays. 12th Sept marks the 10th anniversary of Apple products as the wait is over finally. Apple has more operating cash than the U.S. Treasury. 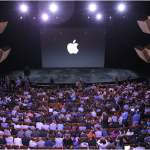 Apple company was determined to do something new this year.They proved it today in Apple keynote event.It was held at the newly opened campus which is a public debut of Steve Job theater, California. The company has revealed an iPhone 8, an iPhone 8 Plus, and a special 10th-anniversary model called the iPhone Today. President Trump asked Apple to build gadgets in the USA instead of China. Today’s latest version is higher in price due to the production cost of US. We’ll be updating you with key rumors between now and then so stay tuned.